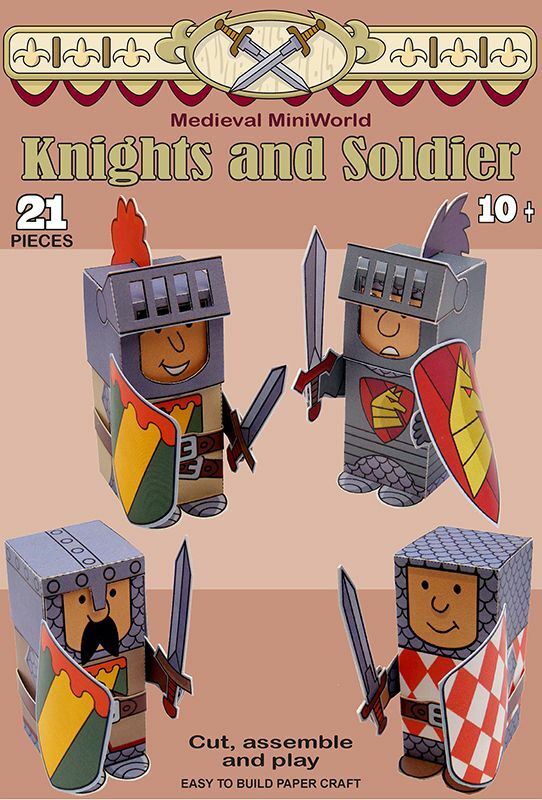 4 knight figures to cut out and assemble from the series medieval MiniWorld. Perfect to enhance homeschooling studies of medieval history, these mini-figures are about 5 cm high and come with many removable accessories. You can also print them in a larger size for a school display. This Medieval MiniWorld set is compatible with other MiniWorld sets (The Castle, The Dinosaur series, The Vikings, the antiquity series and the Bible MiniWorld series). Once you have downloaded a set you can use different parts such as the terrain tiles or scenery to add to your other new sets; also you can print several copies of certain parts and assemble them in a variety of ways to create a larger set.